The teaching of the Buddha arrived in Tibet, the cool land of the Snowy Ranges, during two periods known as the Early and the Later Translations. The well-known Kagyupa, the protectors of beings, are among the latter of these, the New Schools of the Later Translations, and the possessed the mandate for its Practice Lineage. The great master by the name of Tilopa received four such transmissions, from Vajradhara and Vajra Yogini, who appeared to him in person to entrust him with the treasury of the four sections of Tantra. Naropa, the great pandita, was the next in the lineage. He followed Tilopa by undertaking twelve major trials. At the end of these, he understood the complete meaning simply through a gesture and a few words, and reached accomplishment. Marpa Chokyi Lodro of Lhodrak went to India four times where he met many learned and accomplished masters, headed by Naropa and Maitripa, from whom he received all the teachings on Sutra and Tantra. In particular, he followed Naropa for a combined length of sixteen years and under his guidance Marpa integrated his learning, reflection and meditation training. He received the special Hearing Lineage of Chakrasamvara with consort in its completeness. Back in Tibet, Marpa had four chief disciples who propagated his profound teachings. Three of them, Mey, Ngog and Tsur, propagated the Teaching Lineage, while Jetsun Milarepa became the one who received the mandate for the Practice Lineage. Among Milarepa's disciples, seven departed to celestial realms at the end of their lives, eight became great Repa-yogis, and there were innumerable others. Of his two chief disciples, one was the moon-like Rechung Dorje Drakpa from whom the Rechung Kagyu lineage sprung. The other was the sun-like Dakpo Dawo Zhonnu, also known as the great matchless Gampopa, who was prophesized by the Victorious One, and was equal to the Buddha coming back into the world. Gampopa had an untold number of disciples which he brought to maturity and liberation. His principal lineage-holders were Barom Darma Wangchuk who originated the Barom Kagyu; Pagdru Dorje Gyalpo who began the Pagdru Kagyu; the illustrious Dusum Khyenpa who founded the Karma Kagyu; and the disciple of Ongom Tsultrim Nyingpo by the name Zhang Tsalpa Tsondru Drakpa who founded Tsalpa Kagyu. These are known as the Four Great Kagyu traditions. In addition, the Dakpo Kagyu originated from a succession of masters, the Three Uncles and Nephews of Dakpo at the seat of Dakpo Tsalmi. 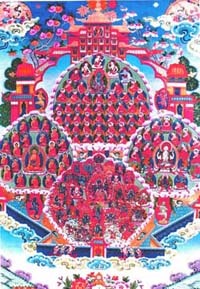 The Eight Lesser Kagyu schools originated from the five hundred parasol-bearing disciples of Pagdru. They were the Drigung Kagyu from Kyobpa Jigten Sumgon; the Taklung Kagyu from Thangpa Tashi Pal; the Trophu Kagyu from Drogon Gyaltsab; the Lingrey (Drukpa) Kagyu from Lingje Repa Pema Dorje; the Martsang Kagyu from Marpa Rinchen Lodro; the Yelpa Kagyu from Yelpa Yeshe Tsek; the Yabzang Kagyu from Gyalwa Yabzang; and the Shugseb Kagyu from Nyepu Gyergom Chokyi Senge. Over time, each of these schools had innumerable chief and subsidiary monasteries.